Do you own a set of Pie Irons? Are you just getting started in this fun hobby of campfire cooking? 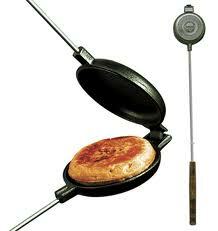 We have assembled a large selection of Pie Iron Recipes for you to try on a next camping trip or backyard cook out. With your help we can continue to grow. Many of these recipes you have seen before and some you may have not. Many of these recipes you have seen before but you know them by a different name. We encourage you to try them all and develope your own versions of these popular recipes or even come up with new ones. Each recipe has a comment section for you the add helpful hints or what you like or changed about each recipe. Do you have a talent for cooking? Especially outdoors while camping? Please send us your favorite campfire recipes to be included in the Pie Iron Recipe Collection. We will include your Name and Location with each recipe. Please send along photos of your recipes or other images of outdoor cooking using pie irons for our NEW Photo Album. 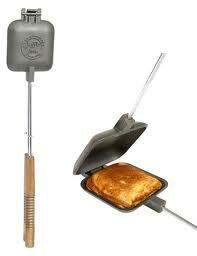 We hope to make PieIronRecipes.com a Pie Iron and Outdoor Cooking Community. Please write us about your outdoor adventures. We would love to read them, Can you Imagine your article on our website.